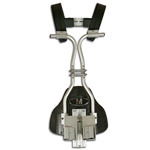 The new Jim Kilpatrick ABS bass drum carrier is the flagship model in the range. The revolutionary Articulating Back Support (ABS) is an ergonomic cornerstone of the carrier design, promoting correct spinal posture. The ABS helps to correctly distribute weight and energy ensuring both comfort and safety. Featuring a raft of new design features including fully adjustable standard Magnesium shoulder supports, new single key adjustment with contour hinge, new 'Starship' bracket with sliding height adjustment all made from incredibly strong and equally durable ultra-light materials. The Kilpatrick May abdomen plate is virtually free floating; bearing no weight from the drum allowing complete freedom of movement. Intelligent weight distribution transfers the weight of the drum to the tubes, away from the abdomen plate improving rigidity and stability. Adjustable lock nut hooks create the perfect stability between the drum and the player. Can be adjusted to fit any make and size of bass drum. Monoposto bracket provides ultimate playing positions, regardless of the size of drum or player. The new Jim Kilpatrick standard bass drum carrier features a raft of new design features including fully adjustable standard Magnesium shoulder supports, new single key adjustment with contour hinge, new 'Starship' bracket with sliding height adjustment all made from incredibly strong and equally durable ultra-light materials. The Kilpatrick May abdomen plate is virtually free floating; bearing no weight from the drum allowing complete freedom of movement. Intelligent weight distribution transfers the weight of the drum to the tubes, away from the abdomen plate improving rigidity and stability. Adjustable lock nut hooks create the perfect stability between the drum and the player. Can be adjusted to fit any make and size of bass drum. 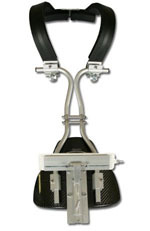 Monoposto bracket provides ultimate playing positions, regardless of the size of drum or player. The Jim Kilpatrick snare drum carrier adaptor is easily mounted to your Andante pipe band snare drum for full compatibility with the Jim Kilpatrick signature snare drum carrier. Please note this adaptor is not supplied as standard with the Jim Kilpatrick signature snare drum carrier, and is for use with the Jim Kilpatrick snare drum bracket supplied with the snare drum carrier. The Pearl High Tension Drumkey provides an easy method for tuning marching drums or any other drum that requires extra tension and leverage. 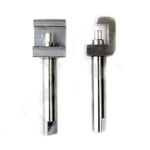 This key will deliver the tourque needed without spending a fortune to get it. The Royal blue Drumstick holder attaches very easily onto the top and bottom tension rods. The holder will carry up to two pairs of marching drumsticks. These covers are made from a high quality 100% waterproof material, with navy blue on the playing side. The rain water runs of the snare head cover very quickly, which ensures good accurate playing at all times. The cover sits completely flat on the drum and can be easily fitted or removed within seconds. The cover dries out quickly after use. A must for all Pipe Band.